Brief Synopsis – The friendship of a star picture and a catcher is tested when they must deal with the terminal diagnosis of the catcher. My Take on it – This is a film that I’ve been interested in seeing for quite some time yet never got a chance to do so. 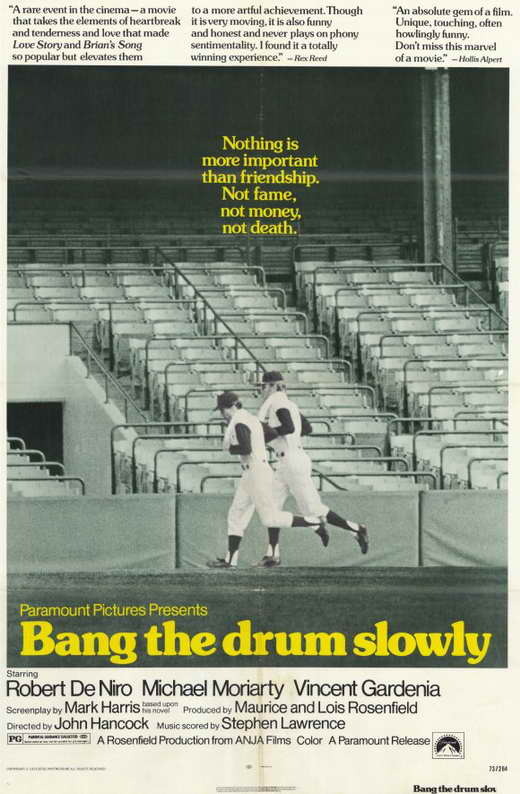 The overall premise is great because it tries to explore the strong bond of friendship between two ballplayers; a pitcher and a catcher and how they deal with the situation when one of them is diagnosed with a terminal illness. The story tries to show to what lengths one may go in order to help a friend in need under these kind of circumstances. The biggest problem here tho is that there is no chemistry between the two leads played by Michael Moriarty and Robert De Niro and that takes away so much since that is essential for such a story about an unbreakable friendship. It’s actually hard to imagine they are such close friends by the way things are portrayed here. The story itself feels very rushed at certain points when they should be establishing the strength of their bond in a much more succinct fashion. Vincent Gardenia stands out as the manager of the team they play for and he was quite deserving of an Oscar nomination for Best Supporting Actor for his performance here. Bottom Line – Nice story about friendship in difficult times and what one is willing to do for another in such circumstances. Unfortunately the chemistry between Moriarty and DeNiro is quite lacking here and it’s hard to imagine them really as friends. The story feels a bit rushed at certain points especially when they could possibly work to establish the friendship much more succinctly. Gardenia was nominated for an Oscar for Best Supporting actor for his performance as the team’s manager and he clearly does stand out among the entire cast.